My question in this entry is whether Differentiated Instruction (DI) can be justified for the opportunity it offers to kick-start and scaffold the process of becoming a self-directed learner. Differentiated instruction (DI) comprises a set of instructional strategies that teachers employ selectively to address the diverse learning needs of students. For a more complete account, kindly click here. DI is controversial. For example, consider this quotation from Colin Everest: “Differentiation is just another pressure meted out by managers… Apparently I must use a variety of methods at every turn and I must present every topic through a variety of methods and approaches.” It can create an extra burden for teachers and so needs to be justified with compelling evidence that it is a worthwhile investment of teachers’ energy and time, and compares favourably with alternative approaches in terms of impact on learning. However, leaving that debate aside, I propose that DI may merit consideration because of its relatedness to Self-Directed Learning (SDL). …in order to increase the likelihood that each student will learn as much as he or she can as efficiently as possible. …in order to increase the likelihood that s/he will learn as much as s/he can as efficiently as possible. In both DI and SDL, the element of choice is central, and informed choice at that. 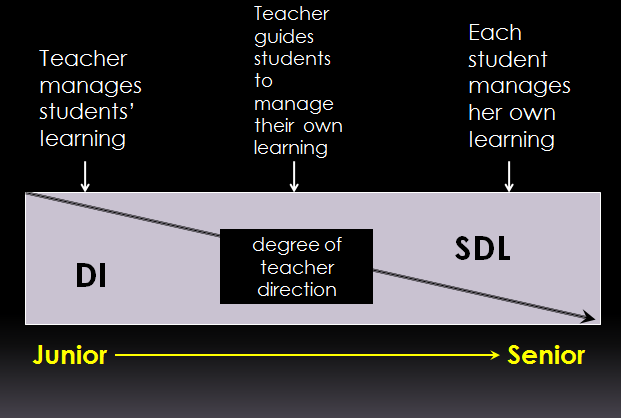 The difference is that in DI, it is the teacher making choices, and in SDL it is primarily the learner’s responsibility. Following the learning, there is reflection and evaluation by the teacher and learner, and adjustments to future learning are made as a consequence. I envisage teachers using DI in the early years of instruction, with the teacher making their decisions transparent to learners, followed by progressive transfer of control to learners as the students advance through their school careers. Perhaps in the last years of secondary/high school, the learners may be making most of the decisions about their own learning, thus exercising metacognitive skills prior to entry to higher education or the workplace. Do you think this is worthwhile exploring or researching? I welcome reactions…. Tomlinson, C.A. (2003). Differentiating instruction for academic diversity. In J.M. Cooper (Ed. ), Classroom teaching skills. Boston: Houghton Mifflin. Rinvolucri’s realization is a common one. In fact, advocates of DI go further, suggesting that it is not just abilities that vary between learners but also degrees of interest and learning styles. All of these variations, it is argued, beg a considered and positive response from the teaching profession. The movement towards catering for all learners also gains support from the fact that in many countries equal access to educational opportunities is enshrined in law. Differentiated instruction is an attempt at a systematic response to learner differences, a framework to help teachers move away from ‘teaching to the middle’. Tailoring lessons for the middle band of students in a class results in some students being over challenged, some under challenged, some unable to gain access to key concepts, and many demotivated. By contrast, with differentiated instruction the aim is to arrange lessons so that all students progress towards desired learning outcomes but reach them in ways that are personally suitable. Lecturers and teachers try to make it possible for all learners to acquire course content, make sense of ideas, and develop learning products that are compatible with their learning profiles. Differentiated instruction is by no means a new phenomenon. Teachers have always practised some degree of differentiation simply by noticing which students require more or less challenge and by asking them different questions. But as a systematic response with a ‘package’ of strategies it is fairly recent. It has been around since the 1980s when it was introduced for the sake of gifted students, and it has received fresh impetus with the move to include students with disabilities into general education classrooms. The cultural make-up of classrooms has also become very diverse with the presence of immigrants and international students. In the United States’ public school system for instance, differentiated instruction has been applied at all levels for students of all abilities. Moreover, it is now an accepted part of pre-service training for teachers in many parts of the world, especially North America, Europe and Australasia. Differentiated instruction has a number of proponents. Key writers on the subject are Susan Winnebrenner (1992, 1996) and Carol Ann Tomlinson (2000). The former writes about particular types of learners, e.g. those with learning difficulties, whereas the latter provides a particularly clear overview. Tomlinson’s book – How to differentiate instruction in mixed-ability classrooms – is available from the ASCD (Association for Supervision and Curriculum Development) in the USA. The implications, suggests Tomlinson, are that teachers need to provide learning experiences that encourage students to work in their preferred fashion, are motivating, and challenge them appropriately. Additional support for differentiated instruction comes from classroom examples and testimonials from satisfied students and convinced instructors. However, empirical validation of the full model of differentiated instruction is rather lacking. It is an area that warrants future research. I assisted with action research conducted by teaching staff at Hong Kong secondary schools from 2007-1012. The school leaders were intrigued by DI because the approach appeared to be consistent with their institutions’ mission statements such as “[School name] educators should try to handle each one in the way she is made.” Following a series of training workshops to introduce the approach, teachers were given freedom to experiment in their classrooms for one academic year after which principals and vice-principals observed lessons. The DI strategies that teachers found more immediately useable were as follows: varied questioning, tiered activities, concept-based teaching and minilessons. It was observed that diagnostic pre-assessments were employed insufficiently at first, but when they were introduced, the following strategies became more workable: curriculum compacting and flexible grouping. As peer feedback became common practice in the school, other strategies became practical, namely peer mentoring and jigsaw activities. In your experience of using DI, has it really had an impact on learning and grades? Delpit, L. (1995) Other people’s children: Cultural conflict in the classroom. The New Press. Gardner, H. (1983) Frames of Mind: The theory of multiple intelligences. Basic Books. National Research Council (1990) How people learn: Brain, mind, experience and school. NationalAcademy Press. Piaget, J. (1978) Success and understanding. HarvardUniversity Press. Rinvolucri, M. (1986) Strategies for a mixed ability group. Practical English Teaching, Vol 7/1. Sternberg, R. (1985) Beyond IQ: A triarchic theory of human intelligence. CambridgeUniversity Press. Vygotsky, L. (1962) Thought and language. MIT Press. Winnebrenner, S. (1992) Teaching gifted kids in the regular classroom. Free Spirit Publishing. Winnebrenner, S. (1996) Teaching kids with learning difficulties in the regular classroom. Free Spirit Publishing.